Its name is “FLYing”, and it is a pendant lamp perfectly suited for office and home. This is the idea that won the international contest “ReAl13 +Light” promoted last year by CiAl – Consorzio Nazionale per il Recupero e il Riciclo dell’Alluminio (National Consortium for the Recovering and Recycling of Aluminium), in collaboration with the IED - Istituto Europeo di Design (European Institute for Design) and the company Oceano Oltreluce, presented at Milan’s 2011 edition of Salone del Mobile. The project conceived by two young designers of the Milan IED, Chiara Grana and Tatiana Radice, was awarded the prize for its simplicity and especially for its low environmental impact thanks to the limited amount of material employed and the reduced energy consumption. Sustainable lighting: this was the theme of the contest “ReAl13 +Light”, a theme perfectly represented by this lamp that recalls through its shape one of the aluminium packaging kinds most widely used at home, as well as the most widely recycled and recyclable: aluminium foil wrap. “FLYing”, placed first at “ReAl 13 +Light”, is going to be produced and included in the catalogue of the company Oceano Oltreluce already starting from this year. Another feature that makes this lamp really “sustainable” is given by the fact that it is going to be an entirely Made-in-Italy product, therefore a virtually zero-mile product. In fact, both the company that intends to manufacture the lamp and the suppliers involved are all based in Brianza, thus ensuring a considerably reduced environmental impact in the production of each single piece. However, “FLYing” is not the only lamp among those submitted to the jury of “ReAl13 +Light” which will go into production. Given the enormous success it met with among the public during Milan’s Salone del Mobile, the company Oceano Oltreluce decided to produce also the lamp “Building” devised and designed by the team of students of the Milan school IED made up of Monica Albini, Bianca Balducci, Fabrizio Latorre and Benedetto Azzini. 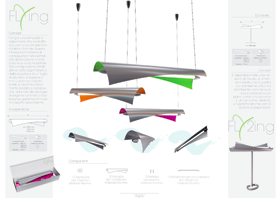 “Building” will be included in the catalogue of the “Alluminia” collection of the company Oceano Oltreluce, a product line dedicated to lamps with a common feature: 100% recycled and recyclable aluminium as their main building material.